Rosen Inn International is located in the heart of one of the world’s most famous destinations, International Drive. 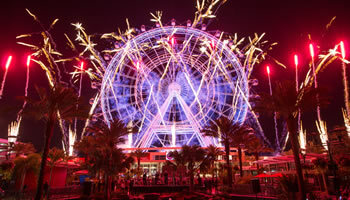 I-Drive, as it is locally known, is the launching pad for many Orlando theme park vacations because it is centrally located near major attractions. Because of its great location, a number of world class restaurants, attractions, and shopping venues have been built on I-Drive to cater to visitors from around the world. During your stay at Rosen Inn International you can enjoy many of these I-Drive favorites that are only a short distance from the hotel. Hotel guests can get to the attractions listed below by using the I-RIDE Trolley. The trolley provides convenient transportation and a pleasant ride while touring I-Drive. Home to the world’s largest McDonald’s PlayPlace, it even has an elevator that takes visitors to a Kid’s Club Tree House. The treehouse has colorful tubes and slides, creating a second-floor indoor playground. This Mickey D’s also has over 100 of the newer swipe card arcade games with a prize redemption center. With so much fun entertainment, this McDonald’s is perfect for hosting a birthday party or other special event for children. One of the most infamous disasters in modern history and the subject of one of the biggest movies ever, the wreck of the Titanic has fascinated for more than 100 years. Those interested in learning even more of the story with an up close view of the Titanic will want to check out Titanic: the Artifact Exhibition, less than a mile from Rosen Inn International. Titanic: the Artifact Exhibition is a 17-gallery, 20,000 sq. ft. interactive museum devoted to the wreck of the Titanic. Guests are treated to guided tours led by trained actors in period dress portraying actual Titanic notables. The attraction also features “Little Big Piece,” 3-ton section of the Ship’s hull, the second largest piece of Titanic ever recovered along with full-scale recreations of her Grand Staircase, First Class Cabin, Verandah Cafe, and more. Advertised as “I-Drive’s Premier Thrill Park”, Magical Midway combines the old and the new in thrill rides, games, and attractions. Within a mile of the hotel on I-Drive, the attraction features two wooden elevated go-kart tracks, a fast track, bumper cars, bumper boats, a carousel, Space Blast tower, and is home to one of the largest arcades in Orlando. Magical Midway is also home to two of I-Drive’s most noticeable rides, the world’s largest Sling Shot and Starflyer. Both can be seen from miles around the park. Magical Midway has free admission and free parking so you can check it out without spending a dime. Rides and attractions are on a cost per ride basis, though they do offer combination ticket deals. The outside of Ripley’s Believe it or Not® looks like it is sinking into the ground. Don’t be fooled, it’s not a Florida sinkhole. However, even the inside of Ripley’s will change your perspective. Explore an amazing variety of exhibits, artifacts, and displays in 16 galleries that pay tribute to the odd, bizarre, and unbelievable. Rosen Inn International is less than a mile from the Rosen YMCA Aquatic Center. It is a short walk or even shorter ride on the I-RIDE Trolley. The hotel is a great choice for families who are competing in one of the Aquatic Center’s many swim meets and competitions. The Rosen YMCA Aquatic Center has three heated indoor pools, totaling more than 1 million gallons of water. With nationally competitive teams in all aquatic disciplines the Aquatic Center has been the training site for many of our country’s Olympic athletes. Over the years, Rosen Inn International has proudly housed many competitors and families of competitors meeting at the Aquatic Center. Dave and Buster’s is an entertainment complex with more than 200 games in the Million Dollar Midway. The games range from new video games to classic video games and ticket redemption games where you win tickets and turn them in for prizes in the Winner’s Circle. Dave and Buster’s has a full-service sit down restaurant and full bar and is a great choice for entertainment of all ages. Pointe Orlando provides excellent dining, entertainment, and shopping all in one spot in the heart of I-Drive. Dining options range from upscale to casual with a side of entertainment thrown in from such notable eateries including Taverna Opa, B.B. King’s Blues Club, and Cuba Libre Restaurant and Rum Bar. Recently added venues include the Improv Comedy Club. The Improv is America’s premier Comedy Club bringing the laughs Thursday through Sunday, featuring top comedic talent on tour. Also located at Pointe Orlando is the 20 screen + IMAX Regal Cinemas. Most Orlando locals call WonderWorks™ “the upside down house.” While driving down I-Drive, seeing a large mansion upside down definitely catches your attention. Apparently an experiment gone awry transported the WonderWorks™ laboratory from the Bermuda Triangle to I-Drive in Orlando. Inside, WonderWorks™ has more than 100 hands-on exhibits that allow visitors of all ages to interact with the WonderZones. Each one focuses on the weird and wonderful world of science with topics like natural disasters, physical challenges, light and sound, and more. WonderWorks™ is next to Pointe Orlando, has ample parking, and can extend your family’s fun day. The Orange County Convention Center (OCCC) is the nation’s premier convention facility and the second largest convention center in the United States. Located a few miles from Rosen Inn International, OCCC is convenient distance away for our guests and easily accessible by a number of local transportation options. Convention visitors have the best of both worlds when staying with us, the fun of a vacation hotel and the convenience of a nearby Orange County Convention Center hotel. Our perfect location is great for guests who want to “double-dip,” allowing their families to enjoy all Orlando has to offer while they take care of business at OCCC. Orlando Premium Outlets offers an exciting collection of 150 outlet stores from the finest designers and name. Please visit our International Drive Shopping pages for more info. Prime Outlets International Orlando is the largest outlet center in the southeast. Please visit our International Drive Shopping pages for more info. Fun Spot America™ is one of the best budget attractions in the area. It features great thrill rides like go-karts, family rides, kiddie rides, a giant arcade, and snack bar. Fun Spot America recently upgraded to compete with the big theme parks by adding three roller coasters. Admission and parking are free. Tickets are available either on a per ride basis or all-inclusive wrist bands.